(GL2) intends to focus on the global dimension for four reasons: (1) cross-boundary challenges are highly complex, which ideally suits the Lab;Ã‚Â (2) enabling progress on global issues creates value for the greatest number of people; (3) a global focus spreads the methodologies of the Lab most widely; and (4) involving multiple countries ensures that this breakthrough methodology will not be used for national advantage but rather for trans-national relationship-building and problem-solving. The Global Leadership Laboratory cannot create a new decision-making Ã¢â‚¬Å“softwareÃ¢â‚¬Â overnight. But it can become a process for discovering what is humanly possible.Ã‚Â It can demonstrate Ã¢â‚¬Å“global leadershipÃ¢â‚¬Â in action, and thus inspire actual decision-makers to measure their performance against this standard. It can also create an optimal environment that inspires imitation around the world. If successful, within a decade of its founding, the methods employed by (GL2) will be adapted and replicated by global organizations around the world. In hindsight, thoughtful observers frequently lament the decisions that public officials make, particularly in international affairs. Critics point to geopolitical decision-making processes that are slow, fragmented, poorly informed and myopic. But these complaints about the quality of decision-making never reach the next step. The next step is to create an environment in which decision-makersÃ¢â‚¬â„¢ capabilities are optimized. And, to our knowledge, this environment does not currently exist. Consider, for example, the renowned Ã¢â‚¬Å“Situation RoomÃ¢â‚¬Â in the White House that has been portrayed in dozens of movies, but has rarely been seen by ordinary citizens. Until its renovation last year (2007), thisÃ‚Â windowless bunker, supposedly the Ã¢â‚¬Å“gold standardÃ¢â‚¬Â regarding high-level strategic decision-making environments, was neither pleasing not efficient. Henry Kissinger himself called it Ã¢â‚¬Å“uncomfortable, unaesthetic and essentially oppressive.Ã¢â‚¬Â KissingerÃ¢â‚¬â„¢s frank assessment not only suggests that the situation room failed to inspired higher levels of thinking, but that it actually deadened the human potential in the room. Evidently, the situation room was also decidedly backward technologically. It was equipped only with computers and telephones with 1985-era technology, fax machines, and cathode ray tubes for monitors.Ã‚Â This Ã¢â‚¬Å“low-tech dungeonÃ¢â‚¬Â (to quote the New York Times) did not include any of the cutting-edge technologies or meeting methods that are part of the design of the (GL2) design process. By contrast, DreamWorks, the motion picture company, has developed, in partnership with Hewlett Packard, methods for enhancing virtual collaboration and creativity in ways that most governments, intergovernmental agencies or leading Track II NGO have not. Private sector organizations believe that they have to innovate to compete; public sector or nonprofit organizations all too often believe that they must continue to follow Ã¢â‚¬Å“diplomatic protocolÃ¢â‚¬Â or Ã¢â‚¬Å“ cultural customsÃ¢â‚¬Â and therefore do not innovate. The result is a decision-making process that fails to evolve rapidly enough to deal with the evolving challenges. It is tragic, but true, that pivotal formal meetings between nations and their representatives, both on the Ã¢â‚¬Å“Track IÃ¢â‚¬Â or governmental level and in Ã¢â‚¬Å“Track IIÃ¢â‚¬Â citizen diplomacy, commonly take place in bureaucratic meetings rooms or hotel conference centers that are even less conducive to awareness-raising. Even when they occur in Ã¢â‚¬Å“historicÃ¢â‚¬Â castles or Ã¢â‚¬Å“exclusiveÃ¢â‚¬Â clubs, the elite surroundings usually reflect the styles of previous eras, not the latest proven methods for building trust and enhancing collective intelligence. In facing both short-term and long-term challenges outlined in Appendix I, various efforts have been made to improve the process and outcome of decision-making.Ã‚Â Countless commissions, conferences, joint research projects, advisory bodies, and intergovernmental panels, etc., have been convened. But never, to our knowledge, have best practices from all the relevant Ã¢â‚¬Å“practice areasÃ¢â‚¬Â been integrated and applied to global problem-solving. When Herculean tasks have been performed Ã¢â‚¬”Ã‚Â such as the development of the atom bomb, or the lunar landing Ã¢â‚¬” great knowledge and collaboration was required. But the teams that determined these goals, and then achieved them, were under the supervision of a single national government. The challenge facing humanity today is to solve complex problems that far exceed the capacity of any single nation to make such decisions, and that require the highest possible performance from each decision-maker. Today there exist a robust set of proven tools and methods for raising decision-makersÃ¢â‚¬â„¢ level of awareness. But many of them are rarely used, and they are never used in a coordinated, integrated manner. Unless this need is met, humanity will continue to make second-rate decisions. Until we have (GL2)Ã‚Â like high-functioning environments, both physical and virtual, that inspire a new level of awareness and collaboration, time will be lost and scarce resources misallocated even though we can no longer afford to do so. The Global Leadership Laboratory is designed to respond to this urgent need for higher-awareness decision-making regarding both short- and long-term global challenges such as the eight outlined above. But (GL2) will not be defined by the particular content areas on which it focuses, but rather by the design principles that it applies. – Principle 1. Includes all strategically relevant perspectives in real time. The network of conveners of the Lab will be so diverse geographically and politically that stakeholders could be systematically and rapidly included in the conversation. – Principle 2. Employs state-of-the-art visual data management and presentation methods. (GL2) will set a new standard for including global problem-solving software, skillful human-computer interface, GeoEye and Google Earth geographic data, etc. – Principle 3. Applies remote meeting technologies for rapid convening of virtual conversations. By using either Hewlett PackardÃ¢â‚¬â„¢s HALO Systems technologies or CiscoÃ¢â‚¬â„¢s TELEPRESENCE tools, (GL2) will enable almost anyone anywhere to be Ã¢â‚¬Å“presentÃ¢â‚¬Â at short notice. – Principle 4. Organizes and designs workspace that invigorates, catalyzes and inspires. Unlike current venues, (GL2) will bring in the environmental attributes that have been proven to raise levels of human performance. – Principle 5. Remains fiercely independent by virtue of its transnational, cross-cultural governance structure. (GL2) will be governed by a Board of Directors that is as diverse as humanity itself, and that will not be subject to the Ã¢â‚¬Å“vetoÃ¢â‚¬Â or Ã¢â‚¬Å“censorshipÃ¢â‚¬Â of any single nation of group of nations. Based on principles illustrated by this preliminary list, (GL2) will be designed as an experimental laboratory, both concrete and virtual, to test and apply methods for raise the level of awareness in decision-making processes. Both the failures and successes of the Lab would contribute to a state-of-the-art environment that could set a new standard for integrating the best and next practices from all the relevant decision-making domains. The proof that these and other design principles implemented by (GL2) actually raise the level of decision-making will be determined by what happens in the Lab. But from a wide set of experiences, evidence abounds that principles such as these produce breakthroughs that are much harder, if not impossible, to achieve in conventional decision-making venues. The commonly used term Ã¢â‚¬Å“best practices,Ã¢â‚¬Â however, does not adequately convey the challenge of designing (GL2) Ã‚Â . The challenge is not only to collect current best practices in key fields, but to design next practices based on facilitation methods and information technologies that have never been systematically applied to global problem-solving. From where can these best practices and next practices be drawn? At present we have identified the four domains of innovation that need to be included in the design process: (1) Human Domain; (2) Facilitation Domain; (3) Technical Domain; and (4) Convening Domain. (2)Ã‚Â Design /Facilitation Domain. Simply convening intelligent people from around the world is obviously only a first step. We have all been at gatherings where the mental horsepower was phenomenal but the outcome was not. In fact, there is sometimes an inverse relationship between the total intelligence present and the quality and speed of decision-making. The missing ingredient is Ã¢â‚¬Å“facilitation intelligence,Ã¢â‚¬Â the capacity to design and execute a process that brings out the best and highest intelligence of all the participants. (GL2) is being designed based on the best cross-cultural facilitation knowledge in the world. From Western partners such as the Harvard Negotiation Project and Synergos to Asian partners such as Civic Exchange, as well as corporate partners such as IDEO partnership, the Lab will be able to engage the strongest possible facilitation expertise. When appropriate, this will include the pioneering methods being developed that include nature, vision quests, inner work, collective intelligence and other avenues for raising awareness. (3)Ã‚Â Technical Domain. Despite the interconnected, Ã¢â‚¬Å“flatÃ¢â‚¬Â world in which we live, too much Ã¢â‚¬Å“intelligence-gatheringÃ¢â‚¬Â is still conducted wearing blinders of nationality, ideology and language. Optimal decision-making requires the best, continually updated information Ã¢â‚¬”Ã‚Â not just from oneÃ¢â‚¬â„¢s own national and language sources, but from throughout the world. Unfortunately, most decision-making environments are information-poor. They lack the technical and media support that would catalyze higher levels of awareness and collaboration.Ã‚Â (GL2) is being designed to correct this serious failure. The Lab is being co-designed in partnership with pioneers in computer software, media, virtual communications, satellite photography, etc. This collaboration will ensure that the Labcreates an information-rich, high-interaction environment that will inspire participants in decision-making processes to challenge their own and each otherÃ¢â‚¬â„¢s perspectives and to shift significantly their own awareness. If even the best practices of these three kinds of intelligence were integrated into (GL2), it would represent a major breakthrough. Never before, to our knowledge, have the best human, technical and facilitation practices been integrated and applied to the design of a global problem-solving environment. But for the Laboratory to fulfill its purpose, another critical kind of Ã¢â‚¬Å“intelligenceÃ¢â‚¬Â is also required. (4)Ã‚Â Convening Domain. If breakthroughs in the thinking occur in the Lab, that demonstrates the effectiveness of (GL2). But such breakthroughs will have a concrete impact on global problems only if decision-makers adopt the new thinking. If they are not part of the Lab process, it is unlikely that they will quickly endorse and implement new ideas. It is far more likely that they will do so if they are present and engaged in the decision-making work.Ã‚Â (GL2) will benefit from the involvement of the East West Institute, and our working partners within the EU and the United Nations, who have demonstrated convening capacity to bring almost any relevant public official into our deliberations. 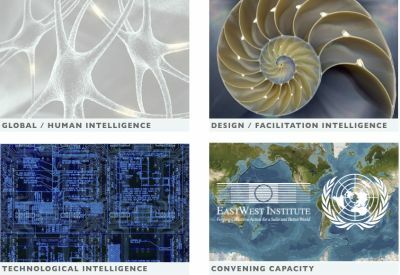 Whether it is the UN Secretary-General hosting the recent WMD meetings in New York, the Swiss or German governments supporting our projects, or engagement with top Russian or Chinese leaders, it is clear that EWI and partnering organizations can successfully bring decision-makers at the highest level to the Lab. Because of their age, temperament, and biographies, many of these leaders have never been exposed to transformative opportunities such as those provided by (GL2). By identifying and integrating best and next practices from these four domains, the Lab would become a pre-eminent venue used by global organizations that seek opportunities to make wiser choices about the human future. Because best practices in these areas are present in every sector, and because both private and public resources and institutions are needed to solve these complex problems, the Lab must be a cross-sector partnership. For this reason, we are inviting to first design meeting key advisors from each of these four domains. 1.Ã‚Â A representative from the worldwide network of global policyÃ‚Â thinktanks. 2.Ã‚Â Colleagues from technical partners such as GeoEye or Google Earth, Motorola, MIT, Hewlett Packard or others. 3.Ã‚Â Partners with facilitation and problem-solving expertise such asÃ‚Â Harvard Negotiation Project, Synergos, the Arlington Institute or IDEO. 4.Ã‚Â Participants from EWI, the United Nations and other intergovernmental partners. We are now in a preliminary development phase and are reaching out to potential partners who can contribute their expertise to this crucial design process. (GL2) Ã‚Â will never exist in any final form. Like software, it will be continually updated and improved based on what we learn from both its success and its failures. So what is being proposed here is the launching of a design process that will continue indefinitely, and will result in a Ã¢â‚¬Å“global learning organizationÃ¢â‚¬Â that serves humanity in a wide variety of content areas. But like any long journey, the first step is critical. To be sure that the first step is taken in the right direction, by the right team, we are beginning quietly with an inquiry into the feasibility of the Lab concept and with a network of individuals whose creative, open minds and collaborative spirits will help us take this embryonic concept and give it life. These individuals must come from both the public and private sectors, and together must create a working team that effectively bridges this divide. While some issues still remain the exclusive province of either the public sector or private sector, virtually all of the major global challenges facing humanity do not fit narrowly into one or the other. For this reason, (GL2)Ã‚Â is envisioned as true public-private partnership, and the participants in the design process will reflect this essential fact. Even more challenging, (GL2) is envisioned as a transnational project that cannot be dominated by any single nation or culture. As Stephen Heintz among others has underscored, the governance of the Lab must reflect its ultimate purpose. For this reason, although initial development of the concept is being incubated by Mediators Foundation and the East West Institute, two US-based NGOs, its early development will include colleagues from Europe, China, and other critical partners from around the world. Finally, in terms of financial support, (GL2) is envisioned as partnership between two organizations, one that will be profitable and operate as a consulting business and the other that will operate as a nonprofit NGO. The sources of funding for these two inter-related entities will necessarily be different: the former will seek investment capital and will develop multiple revenue streams; the latter will seek philanthropic support combined with revenues that are appropriate to its nonprofit status.